Brief: Dawson & Associates is an independent chartered surveyors based in Rye that offers all aspects of surveying, valuation, design and professional building management required for residential and commercial property portfolios in the UK. The family run professional outfit has a long standing association with the Faculty of Party Walls Surveyors and also offer support for a variety of properties in France and Spain. As the firm’s website hadn’t been updated for a number of years, PRG was tasked with creating a new website as well as generating new target market relevant content each month and optimising the company’s Google Adwords (PPC) campaigns. PRG has a great track record in content generation and creation of user friendly secure device responsive websites for property service companies throughout the South East, making PRG the ideal partner for Dawson & Associates on this project. 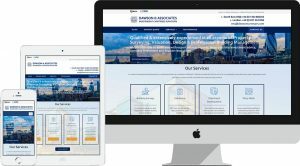 As the brand was already well established, Dawson & Associates wished to incorporate the colour theme of the coat of arms logo within the new website design whilst showcasing their work in a more modern style. In addition, PRG has implemented bespoke enquiry forms for each of the company’s core services, has added trackable call to action areas on each page and “Request a call back” functionality to the header area of the website. To further enhance the website visitor experience, PRG’s web team has delivered a customised platform on which Dawson & Associates clients can leave testimonials with five star ratings to coincide with the firms’ Reallymoving.com listing. Whilst the new website was being built, PRG’s content generation team provided a number of topic ideas and wrote relevant and timely blog articles for the website in order to enhance SEO performance. In the meantime, keyword research was conducted using a number of online tools ahead of setting up the targeted PPC campaigns. Since its launch in November, the website has generated quality leads and has attracted numerous readers to the new blog content. The Google Adwords campaign is also showing promising results with over 4,500 impressions, over 120 clicks and a decent average click rate of 2.69% achieved within the space of just six weeks. PRG will continue to provide on-going website maintenance to Dawson & Associates, whilst closely monitoring PPC CTR (click through rate) performance and delivering fresh content ideas and suggestions that will continue to attract suitable client base for this extensively experienced chartered surveyor from East Sussex. When carefully monitored, PPC can really prove ROI without being overly costly to run. The first year of working with PRG has been proactive and productive and we all look forward to continuing our collaborative relationship into the New Year.